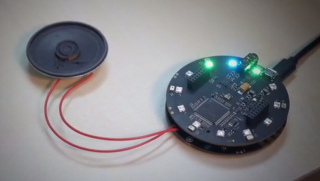 New Kickstarter project aims to add voice control to any speaker | What Hi-Fi? The ReSpeaker from Seeed will stream music to any speaker with a headphone jack, and allow you to control playback with voice commands. In-built voice control in your home speaker is not a new concept, as demonstrated by the Amazon Echo. With Sonos rumoured to be adding a similar feature to its products, more are doubtless on the way. However, a new Kickstarter campaign looks set to go one further, offering voice control functionality to any and every device with a 3.5mm headphone jack input. Once plugged in to your audio device, the Seeed ReSpeaker connects to your wi-fi network and can then be controlled through an app or browser. For offline playback, the ReSpeaker can also keep audio command files and music in local storage. The ReSpeaker features a file manager system and music streaming compatability, so it is assumed that it can be used with streaming services such as Spotify, Tidal and Deezer. The company reached its $40,000 (£30,000) target in under 12 hours, with 29 days remaining before the Kickstarter closes. Seeed says that it will begin working on stretch goals for the product.